The new wave of Philadelphia sports stars is here – Bryce Harper with the Phillies, Joel Embiid with the Sixers, Carter Hart with the Flyers and still in his early seasons with the Eagles, Carson Wentz. Out with the old, in with the new. That’s the way we do things in this world. But there’s one veteran Eagle preparing for the 2019 season who is worthy of a moment or two of offseason appreciation. Jason Peters turned 37 years old in January, the equivalent of how many years in an NFL left tackle’s life, exactly? Originally signed by the Buffalo Bills in 2004 as a tight end for the hefty sum of a $5,000 bonus, Peters has had one of the most remarkable careers in the history of the league. After spending one season mostly as a tight end with the Bills, Peters transitioned full time to offensive tackle and, well, he hasn’t looked back. Nine Pro Bowls and six All-Pro selections later, Peters is back for more. He and the Eagles re-worked a contract for the 2019 season that ushers Peters into his 17th season. He’ll be the Eagles’ starting left tackle once again, an underrated depth-chart reality among many more high-profile roster moves the Eagles have made in the last month. How much the Eagles get out of Peters remains to be seen, of course. Peters tore his ACL seven games into the 2017 season and then returned for 2018 and started all 16 games, battling his way through the season, taking part in 79 percent of the team’s offensive snaps. He played in both postseason games and, honestly, did an outstanding job. Nobody has spent much time talking about what Peters’s return means, so let’s do it here with the NFL Draft only a few weeks away. Peters gives the Eagles an insurance policy protecting Wentz’s blind side, with young veteran Halapoulivaati Vaitai expected to be the backup and second-year prospect Jordan Mailata still in the developmental phase of his career. 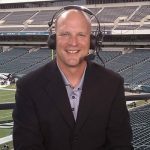 The Eagles want the best from Peters – 16 starts, great health, perfect technique – as he’s given them the best of him since the team traded for Peters in 2009 at the cost of two first-round draft picks. But he’s 37, and all of those snaps through the years have taken their toll and, truth be told, nobody can predict Peters’s path this season. At the very least, Peters starts and is more than solid and Vaitai rebounds from a step-back season in 2018 and Mailata shows in his second year playing football ever that he’s on track to becoming a contributor. At the very best, Peters reaches into the Fountain Of Youth and has himself a throwback year and plays at an All-Pro level once again. History – recent injuries included – suggests that the reality will be somewhere in between.